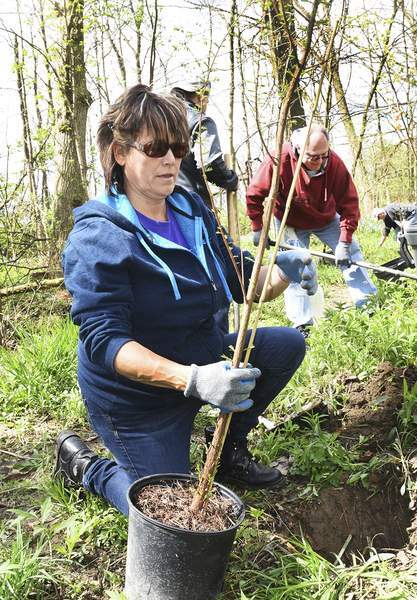 Cathie Rowand | The Journal Gazette Robin Adkins and fellow Fed Ex employees plant trees along Trier Ditch Friday at Heatherwood Park in New Haven. The Earth Day project continues today and Sunday. Looking for a way to observe Earth Day? Save Maumee, a grassroots group committed to preserving the area's rivers, could use your help. The group is planting 1,100 trees this weekend in an effort that began Friday at Heatherwood Park in New Haven. Today, volunteers are invited to help plant trees at Moser Park in New Haven from 11 a.m. to5 p.m. The event continues from 11 a.m. to3 p.m. Sunday at Heatherwood Park. The trees are native species: river birch, sycamore, black willow and more. Save Maumee planted 840 trees and removed 2,000 invasive species in 2016, all through volunteer efforts. The goal is to improve the health of the region's waterways by creating buffers in the Trier Ditch, Bullerman Ditch and Sixmile Creek drainage areas of the Maumee River.